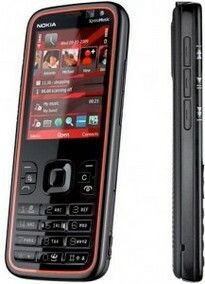 The 5630 was announced the week, and as the title gives away, it is an XpressMusic handset. What the title doesn’t give away however, is how good the phone actually is. Now being a music based phone, this Symbian powered mobile comes bundled with a music player, dedicated music controls, Stereo Bluetooth, the all important 3.5mm jack and a 4GB memory card (microSD) to store up to 3000 tracks. However, if you consider 3000 songs to be a paltry amount, you have the option to stick a whopping 16GB of storage in its insides. Nokia have also thrown in what they call the ‘Say and Play’ feature, which in a similar way to voice activated calling, enables you to say a song or artist and providing you were coherent enough, the phone will play it for you. But it’s not all about the music. The 5630 packs HSDPA, making internet activity and shopping in the Nokia Music Store a breeze. It also comes with the N-Gage experience, complete with an N-Gage shortcut on the home screen – keeping gaming at you fingertips, just in case you need to play a game “right this second”. Additional features include a 3.2 megapixel camera And if you’re the type that likes to keep tabs on your life, the contacts bar will provide direct access to up to 20 friends straight form the homescreen, complete with a full communication history – recent emails, messages, phone logs and photos shared. When summer rears its head, so will the 5630 XpressMusic handset, for around 199 Euros or free on a contract. So if you’re in the market for an skinny (12mm) and conventional handset, you might want to hold out for this.